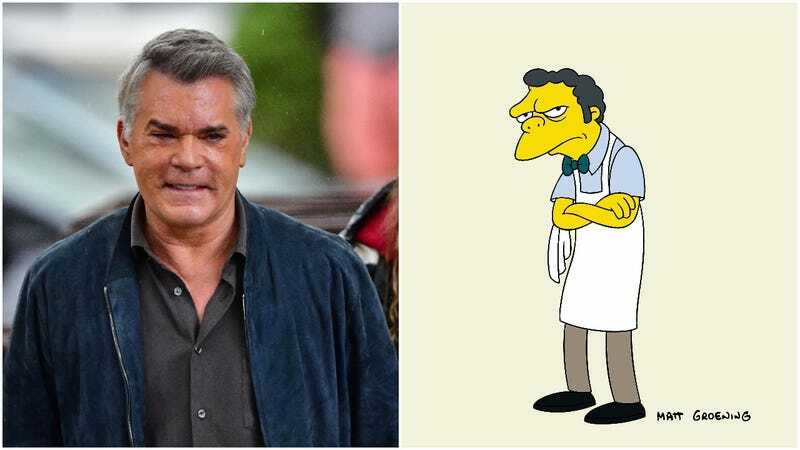 Given his multi-decade reign as one of Hollywood’s go-to gruff-voiced heavies, it’s kind of surprising that Ray Liotta’s never guest-starred on The Simpsons before. The long-running Fox comedy is about to rectify that oversight, though, with Entertainment Weekly reporting that the Goodfellas star will appear on an upcoming episode as, oh, let’s say…Moe’s dad. The Szyslak-centric episode will delve into the backstory of everybody’s favorite black-hearted bartender, described by executive producer Matt Selman as “A Shakespearean family drama, set against the backdrop of a fading mattress store empire.” Also, given the fact that a) Moe is a strong candidate for the second-worst person in Springfield, and b) his dad is being voiced by Ray Liotta, we can probably assume he’s not that good of a dude. The Moe episode will air this April, after the show returns for the second half of its 29th season.